A look at the open source library for building Graphical User Interfaces. I was building an application in Java using LWJGL and was in need of a user interface that would work in conjuction with OpenGL. The option that LWJGL provides is the Nuklear library. They show quite impressive demos on their Github page, but when it came to using the library I found that I could not do anything that was not shown in demo code because most of the functions are not properly documented. The only information we have about them is the name of the function and the data type of the function's parameters. After a whole lot of experimentation and digging through the source code I have gotten a good enough understanding of Nuklear to make practical use of it. In order to save people from having to go through the trouble I did, I am creating this guide. The following guide is written for the LWJGL binding of Nuklear in Java, some of the function parameter counts may differ from the C version, but a lot of the information in here should still be useful even for other languages. The Nuklear library has hundreds of functions, so please forgive me for not documenting everything. I am trying to document enough of it for almost all practical uses. If something is unclear or incorrect, please send me an e-mail. I will update this guide with more widgets, details and corrections when I get the time. Keep track of it here. First iteration of the Nuklear GUI Usage Guide and Tutorial. Function reference entries for all functions used by layout elements and the documented widgets. Struct reference entries for all structs used by layout elements and the documented widgets. This is necessary but not the focus of this document, so please skip this section if you're able to set up a Nuklear context without help. You can copy the code for the setup from the LWJGL demo, I am just giving a brief explanation here for each section of that code. Nuklear is built to be completely platform independent, so it does not actually do any of the work of listening for mouse and keyboard events or drawing to the screen, instead you have to involve other libraries to do that work. For this reason the setup is a bit tedious. For this guide, these libraries will no longer be used after setup is complete, so you do not need to know much about them, but I highly recommend getting familiar with OpenGL since you probably will be using it in other places. All of the code in this section is provided in the LWJGL demo. I am basically copying it as is and adding a few comments for your understanding. If you can get that demo running then you can skip over this section. For convenience, we should import Nuklear and other C functions statically as in the following example. private int display_width, display_height; // The pixel dimensions of the content inside the window, this will usually be the same size as the window. private NkContext ctx = NkContext.create(); // Create a Nuklear context, it is used everywhere. private NkUserFont default_font = NkUserFont.create(); // This is the Nuklear font object used for rendering text. private NkBuffer cmds = NkBuffer.create(); // Stores a list of drawing commands that will be passed to OpenGL to render the interface. private NkDrawNullTexture null_texture = NkDrawNullTexture.create(); // An empty texture used for drawing. * The following variables are used for OpenGL. The following code initializes OpenGL and sets up debug messages. Everything after the first line is optional, you don't necessarily need to turn on debugging for OpenGL. The following code is the definition of the setupWindow() method that was just used. The bulk of the method is mapping GLFW mouse and keyboard inputs to Nuklear mouse and keyboard inputs. The following section creates the font that Nuklear will be using. This section uses the stb library that is packaged with LWJGL. The final section of the code is your program loop, all of your main software logic is handled in here. All of the Nuklear code described in the rest of this document will go in the block labeled /* Nuklear function calls */. // Everything mentioned in this guide will go here. // I recommend putting all of that code into a method. * defaults everything back into a default state. That's quite a lot of code, if you have any questions feel free to send me an e-mail. Nuklear provides UI widgets such as sliders, text fields and buttons, but also provides a system to organize and align them. At the root are windows, these have a specified position and size on the screen. Inside each window you can place rows, these rows are what contain the widgets. Inside a row you may place a group. A group is a container that contains its own set of rows with widgets in them. These will be explained in detail in the sub-sections below. A diagram outlining the different layout components of Nuklear. The root object in any Nuklear layout is the window. The window is not contained by anything, but there can be more than one. When the content of a window does not fit in the window either horizontally or vertically, scroll bars will appear automatically. All windows begin with a call to nk_begin() and end with a call to nk_end(), everything in between the two calls is contained in the window. If the nk_begin() call returns false it is an indication that the content of the window should not be drawn (e.g. the window is minimized). For that reason, the content of the window should be wrapped in an if() statement. Since the name of the window has to be unique, the nk_begin_titled() function was created so that the title bar could show different text than the window's name, allowing two different windows to have the same title while having different names. // Read about the MemoryStack in the struct reference. The nk_end() function call must be outside of the if() condition, otherwise it will not work. On the other hand, the Group widget actually needs to have its _end() function inside of the if statement. Nuklear does not close windows for you. In order to close a window you have to check that the close button was pressed. This is done by checking the nk_window_is_closed() function. Now, because the window is considered closed if it has not yet been drawn, the following code will never actually draw the window. To solve this, we must have at least some code outside of the program loop. It will either be used to detect if the window has been drawn yet or just draw the window before the loop starts. For efficiency, I will create a property that can both check if the window has been drawn and also keep the window's NkRect object so that we don't have to create a new one on each loop. With this approach, we won't need the MemoryStack any more. While we're at it, let's store other window attributes that never change in their own properties. You might want to abstract this window code into its own class that lets you set its options and run the rendering code and you could also add a feature that lets you re-open the same window later on. By sidebar, I mean a static rectangle on the screen that just contains UI widgets. It has no header, or borders and optionally no background. This technique just uses the window options described in the nk_begin() reference. // This sidebar is attached to the left of the screen, is 200 pixels wide and 600 pixels tall. This is cool, but the sidebar isn't the full height of the screen and we can't align it to the right. To fix this, I have created a small abstraction. The abstraction recalculates the window's rectangle on each program loop. Due to the nature of Nuklear windows, this technique does not work on windows that can be resized by the user because Nuklear ignores any size changes after the window is first created. Instantiate the class outside of the loop. Draw all the widgets that belong to the sidebar. I am going to include part of our program loop to illustrate the following example. The full code is in the setup section of this document. float x = screenWidth - 0.1f * screenWidth;  // Same as "x = 0.9f * screenWidth"
See the styling guide before reading this section. The following code shows a variety of different ways to style the window. Remember that if you are creating structs within the loop you need to use a MemoryStack to correctly handle the memory they use. Images need a texture ID provided by OpenGL. Padding and borders are fitted within the rectangle of the window so that the window remains the same width with or without borders and padding. Note: For some weird reason, padding on the window and groups is doubled horizontally. Setting a horizontal padding of 4 pixels will result in 8 pixels of space between the edge of the window and the content. This does not occur for vertical padding. // The background color is an NkColor struct. // appear to work. The .fixed_background() property is what needs to be set. // label_normal() is used for unfocused windows. // label_active() is used for focused windows. // label_hover() is used when the mouse is over the title bar. // are documented right here. This doesn't really fit nicely in any of this guide's categories, but since windows have scroll bars I may as well put it here. There either is an issue with scroll bars in Nuklear, or the way to prevent the behaviour I am about to describe is just not documented anywhere. The scroll bar is always visible even if no scrolling is necessary. The scroll bar is gone and does not reserve any space if scrolling is not needed. The way Nuklear has implemented the scroll bars is the worst combination of hiding and reserving space. I tried adding the NK_WINDOW_SCROLL_AUTO_HIDE option to the window, but it does not do anything. I suspect that, if the window needs scrollbars, this option will hide them after a few seconds of inactivity but still keep the space reserved, which is still the same problem. A row reserves a section of horizontal space in a window and contains widgets, in fact all widgets must be contained directly by a row. The first row starts at the top of the window or group that contains it and each subsequent row is placed below the one before it. You must specify the height of the row and the number of widgets that can fit next to each other on each line. There are a variety of different row functions. A row implicitly ends when another row begins or when the window or group that it belongs to ends. Each row declaration actually adds as many rows as are needed to hold all the widgets. If you declare a row that allows three items per row and then put four widgets in it, two rows will appear. There are two types of row: Static rows and dynamic rows. I will start off describing the dynamic row because I find it more useful. In a dynamic row, each widget in the row occupies a width specified as a fraction of the available horizontal space. By default the widgets are spaced equally, but it is possible to specify the fraction of space for each widget. To create a dynamic row inside a widget or group, you can use the nk_layout_row_dynamic() function to equally space out the widgets or nk_layout_row_begin() to choose how much space each widget takes. If nk_layout_row_begin() is used then nk_layout_row_end() must be called after all the widgets have been added. When using nk_layout_row_begin(), to select the width of the widget call the nk_layout_row_push() function. 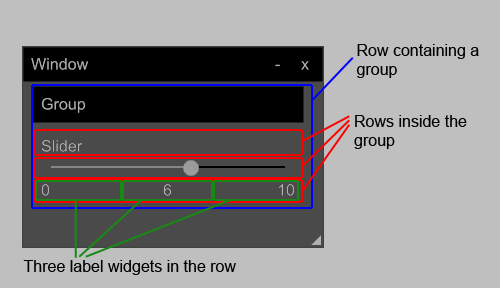 In a static row, each widget in the row occupies a fixed width specified in pixels. The sizes of these widgets does not depend on the size of the container. To create a static row, use the nk_layout_row_static() function to specify the width of all widgets at the same time or use nk_layout_row_begin() to give each widget its own width. If nk_layout_row_begin() is used then nk_layout_row_end() must be called after all the widgets have been added. When using nk_layout_row_begin(), to select the width of the widget call the nk_layout_row_push() function. The only style that could really be associated with rows is spacing. The spacing determines how much space exists between widgets in the row as well as between rows. A group is a container for widgets. It must be embedded in a row like a widget, but contains its own rows and (optionally) has background, borders, title bar and scrollbars like a window. Groups even borrow a lot of their styling directly from the window styling properties. See the styling guide to learn how to give a group a different style from a window using the same properties. Like the window, the group has its own _begin() and _end() functions and the group's name is a unique ID for the group. Due to the name being a unique ID, as with the window, the group has a _begin_titled() function as well to allow for more than one group with the same text in the title bar. The height of a group is given by the height of the row that contains it. If the widgets inside the group do not fit within that height then a scroll bar will appear. // The group contains rows and the rows contain widgets, put those here. Groups inherit their background color and all title bar styles from the window styles. For information on these properties, see styling the window. The group's border and padding are configured separately from the window. As with the window styles, the horizontal padding is always double of what was specified in the styling rule. Styles for all widgets are in the .style() struct of the context. All styling rules are in the form of structs and should be treated that way. To see a description of the styling rules for all of the widgets, go to the section that describes the widget or layout element that the style applies to. This section of the document only describes how styles are used in general. To begin, we can employ a quick method to initialize all of the colors of Nuklear at once. It uses the nk_style_from_table() function. This function takes in a buffer of structs to set up the colors (a struct buffer is an LWJGL thing that is more efficient than an array of structs). Each element in the buffer has one of the NK_COLOR_* constants as its index, which indicates which type of element is being given the color, you can see the C version of this on the Nuklear Github page. This is the only code example where struct buffers are used, so I will not create a guide describing how struct buffers work in general; instead I will just show how to use the buffer in the example code. While this is a good way to quickly set up the basic colors for a theme, many of these colors apply to several different widgets at the same time. If you want to have different colors for each of those widgets then you will have to use the context.style() struct which will be covered in the next section of the styling guide. And now I'll show you the code to initialize the colors of your theme. I have wrapped it in a function and added a createColor() function for convenience because casting ints to bytes is tedious. What is the difference? In technical terms: The first method points the color property to the red struct, while the second one copies the properties of red to the existing struct. The above code initially sets the window background and button to be red, but then changing the button's color is also changing the window's color. If this is the desired behaviour then use this method, otherwise you should use .set() instead. When we created our theme, we set up some general styles, but some of those style rules apply to several different elements. One example is that context.window().fixed_background().data().color() sets the background color for the window but also sets it for groups. Even if that wasn't the case, sometimes we just want two elements of the same type to have different appearances. Each of the stack functions, with the exception of nk_style_push_font() takes in two parameters aside from the context (context is used in practically all Nuklear functions). The first of the two is a pointer to the property that we want to set, such as context.style().window().fixed_background().data().color(), the second is the value we want to set it to in the form of a struct. The nk_style_push_font() function only takes one parameter in addition to the context because one font is used for the whole Nuklear context. The parameter you pass to it is an NkFont struct like the one we created in the Setting It All Up section. Now that you know how to use a stack, let me explain some of the problems with the stacks. // is a float, not a FloatBuffer as the function requires. For that reason, I am not documenting nk_style_push_float() or nk_style_push_flags() and I recommend using the previous technique (storing the old value and setting it back when you're done) for changing float properties and flags. // information about the MemoryStack. As you see, I have seven push_color() calls and seven pop_color() calls, two push_vec2() calls and two pop_vec2() calls. I think that's it for stacks, if you still have questions, be sure to send me an e-mail. For the purpose of handling variables that contain user input from the widgets and for illustrating data that must be initialized outside of the program loop, I will be using functions and classes in the usage examples. If you come across a function declaration, the function needs to be called in the program loop. If you come across a class, the class instance must be instantiated before the program loop and have its method called inside the loop. This widget's only purpose is to show some text. It may be used next to another widget to show its name or value. To use it, call the nk_label() function and pass in the string to be shown and some flags to indicate how the text should be aligned. // and is updated automatically when nk_slider_int is called. // the text may be pushed out of view. NK_EDIT_GOTO_END_ON_ACTIVATE - Starts the cursor at the end of the string when the user focuses the field. The text field uses a C-style string, where the content of the string and its length are in two different variables. The nk_edit_string() function writes the string data itself into a ByteBuffer and the length of that string in an IntBuffer of size 1. We must give it a ByteBuffer that is large enough to hold all the text that we expect the user to write, because the ByteBuffer cannot change size after it has been created. The function requires us to pass in a maximum string length, we can set the size of the ByteBuffer to this value if we're only using ASCII characters. If you want more characters then I would recommend making the ByteBuffer four times the size of the length, so that the string can have up to four bytes per character. When we want to read the string data we have to use the length provided by the IntBuffer to read a specific number of bytes from the ByteBuffer and then transform those into a string. Nuklear::nnk_filter_default - I'm not sure about this one either, it doesn't seem to do anything. Nuklear::nnk_filter_float - Restricted to digits 0-9, ., - and +. Possibly "e" and "E" as well. Given all of the above information, here is an example of how to make a class that will use Nuklear to add a text field and allow us to read its value. // Since we're using ASCII, each character just takes one byte. // We use maxLength + 1 because Nuklear seems to omit the last character. // bytes and pass it into the String constructor. // The cursor_normal() property does not seem to do anything, instead cursor_hover() does that job. // The cursor_text_normal() property does not seem to do anything, instead cursor_text_hover() does that job. A button is an element that the user can click on and it makes that click information available to you. You can write code to perform an action when the button is clicked. When the button is clicked the function that rendered the button returns true, otherwise it returns false. A button is only considered clicked when the left mouse button is released. If you want to listen for press, down, and release actions then you will need to use the nk_widget_has_mouse_click_down() function, which I'll explain in the button examples. A button has either text or an image, each of these types of button has its own function. Nuklear has two different functions for buttons with text and I could not find any difference between the two. The first function is nk_button_label() and the second is nk_button_text(). Since I cannot find any difference between them, I am documenting just the first one and sticking with it for consistency. A button may contain an image instead of text. The image passed in is a struct of type NkImage, see the documentation for NkImage to learn how to create one. The following example shows how to create an image button. The code to generate the NkImage struct should be outside of the main program loop, before the loop starts. By default the button only ever returns true when the left mouse button is released. If we want to check for a press or down event we will have to make use of the nk_widget_has_mouse_click_down() function. This function returns a boolean based on the mouse state of the next widget in the code. It must be magic that it can read the future, perhaps it keeps the state from the previous loop iteration. You have to tell it which boolean to return for the down state, it actually lets you choose that by passing the desired boolean as one of its arguments, I'm not sure why. In order to check whether the button has been pressed or released, we need to keep a record of which value it had in the previous loop iteration. If the previous value was false and the current value is true then the button was just pressed. If the previous value was true and the current value is false then the button was just released. If both of the values are true then the button is currently down. I've abstracted this into its own class for convenience, instances of this class should be created outside of the loop and the render method should be called on each loop iteration, with the isPressed(), isReleased() and isDown() being tested after render() has been called. Buttons have a background color, a background image, a border color and thickness, padding and a rounding radius for corners. LWJGL has a special type of class which represents structs in C libraries such as Nuklear. These classes are used for efficiently handling memory. To create a struct of a given type, if you intend to keep the struct as a property of your object then use the static create() method of the struct's class. If the struct is just for temporary use then create a memory stack and use the mallocStack() method instead as shown below. The properties of the struct in Java are represented as methods. A method with no parameters returns the property's value. Passing in a parameter will set the property's value to the value that was passed in. When setting a property, the method returns the struct itself, allowing you to set multiple properties at once by chaining them. Structs can also be set by using an associated Nuklear function, such as nk_rgba() for the NkColor struct. The rest of this section will be dedicated to showing the properties of each struct and the functions that can be used to set the struct's values. Represents a color to be used when styling. Sets the values of the NkColor that was passed in and returns that same NkColor. Represents a bitmap or a slice of a bitmap to be used when styling. To generate the image struct, you need to be able to reference the image. When using OpenGL, this is done by using the texture ID. The following code is what we need to get a texture into OpenGL. There are plenty of OpenGL tutorials online and I need to focus on explaining Nuklear, so I won't give a detailed explanation here. // file given a path to a file. The code is not short, so it is omitted here. The textureID variable from the previous code can now be used to create the NkImage struct as shown in the following code. In this code, we pass a function to the NkImage, what the function does is take the NkHandle object that Nuklear passes in and sets its .id() property to be the ID of the texture in OpenGL. This method allows us to create an NkImage that only uses a slice of an image file. It takes the texture information and a rectangle, creates the slice and then stores the slice into the NkImage that was passed in. In the next example, instead of showing entire texture in the image, we just show a slice of it. This is good for when you have a lot of buttons and want to give each one an icon. Put all of those icons in one texture and then just cut slices from it. Represents a rectangle, usually used when defining sizes of widgets. Sets the values of the NkRect that was passed in and returns that same NkRect. See Styling the Window for a list of all of the properties and their usage. Represents a 2D vector, usually used when setting style values that can be different horizontally than vertically. Assigns the x and y values to the .x() and .y() properties of the NkVec2 that was passed in and then returns that same NkVec2. Descriptions and usage examples of Nuklear functions. Creates a window. Widget code beyond this point will draw the widgets inside the window. A reference to the context object we initialized when setting up Nuklear. A string used to identify the window, it must be unique among all windows. For nk_begin(), this is shown in the window's header. This is displayed in the header of the window. An object of type NkRect that defines the position and size of the window. NK_WINDOW_TITLE - If this is not present, the window will not have a title bar. NK_WINDOW_BORDER - Shows a border around the window. See the window styling section for information about styling. NK_WINDOW_NO_SCROLLBAR - Prevents the window from ever displaying a scroll bar even when the content exceeds the height or width of the window. NK_WINDOW_MINIMIZABLE - The title bar has a minimize button. When minimized, the all of the content is invisible except for the title bar. NK_WINDOW_SCALABLE - Allows the resizing of the window by clicking and dragging on the bottom right corner of the window. NK_WINDOW_MOVABLE - Allows the user to click on the title bar and drag to move the window. NK_WINDOW_CLOSABLE - The title bar has a close button. Clicking this does not close the window, instead it just sets the window's internal state as closed for one frame. Use nk_window_is_closed() to choose whether or not to render the window. Gives focus to the next text field widget. This is a reserved section of memory in which the function writes the text that the user typed. Indicates the number of bytes in the ByteBuffer contain actual data. Indicates the maximum number of characters that the user is allowed to type into the field. A reference to a function to be used as a filter. I'm not certain what arguments it has to take or what return value it should have, but there are some defaults that can be used which are shown below. Null is a valid value for this argument. Ends the window context. Widget code beyond this point will not be inside the window. Begins a group. For more details see the section about groups. A unique identifier for the group. For nk_group_begin() calls, this may also be used in the title bar of the group. Shown in the title bar of the group, if a title bar is present. NK_WINDOW_TITLE - If this is not present, the group will not have a title bar. NK_WINDOW_BORDER - Shows a border around the group. See the group styling section for information about styling. NK_WINDOW_NO_SCROLLBAR - Prevents the group from ever displaying a scroll bar even when the content exceeds the height or width of the group. NK_WINDOW_MINIMIZABLE - Adds a minimize button to the title bar. It seems to be only for windows and not groups, because clicking the minimize button caused the program to crash. NK_WINDOW_SCALABLE - Seems to have no effect on groups. NK_WINDOW_MOVABLE - Does not work well on groups. Attempts to drag the group around result in the group quickly snapping back into place. NK_WINDOW_CLOSABLE - Adds a close button to the title bar. This probably works the same as with the window, but I could not verify it. See Making a Closable Window for details. Returns true of the content inside the group should be rendered, false otherwise. See Groups for details. Ends a group. For more details see the section about groups. Begins rendering a row of the requested type and specifies its size and the number of elements contained within it. All code that follows this function call will be inside the row until nk_layout_row_end() is called. Pass in the constant NK_STATIC for a static row and NK_DYNAMIC for a dynamic row. The number of widgets that fit horizontally on one line. Begins rendering a dynamic row and specifies its size and the number of elements contained within it. The row ends when a new row function is called or if its parent group or window ends. Ends the row that was started by the most recent nk_layout_row_begin() call. Reserves space of the specified width in the current row for the next widget. The height of this reserved space was determined by the function that started the row. The width of the space to be reserved. The width of widgets contained in this row in pixels. Creates a slider. Documentation for the slider widget will be available in the future. The value that the slider has when the knob is all the way to the left. The buffer to which this function writes the value that was given by the user. This is also used for initializing the slider with a specified value. The value that the slider has when the knob is all the way to the right. The amount by which the slider's value increments for each unit it moves towards the right. I am not sure what the return value is, I will need to do more research. It might return some flags or perhaps the current value of the slider. Sets the colors of all elements and widgets in one function call. See Creating a Theme for details. This is equivalent to an array of NkColor structs. The index in the array indicates which property to change and the element at that index is the color to be used on the specified property. Adds the specified value to the top of the stack for the specified style property. A pointer to the NkColor struct that the stack belongs to. This struct will take the value of whichever element that is at the top of the stack at any given moment. The value to be added to the stack. Adds the specified font to the global font stack. Whichever font is at the top of the stack at any given moment will be used when drawing elements and widgets. A struct containing all of the data necessary to render text. Fonts are complicated to handle, but there is one block of code showing how to set one up in the Setup section. A pointer to the NkStyleItem struct that the stack belongs to. This struct will take the value of whichever element that is at the top of the stack at any given moment. A pointer to the NkVec2 struct that the stack belongs to. This struct will take the value of whichever element that is at the top of the stack at any given moment. Indicates whether a mouse button has been released on top of the next widget. Tests if a window is closed. The name of the window that is being tested. Returns true if the window should be closed, false otherwise.